So, you've got your family tent in the van and you're ready to head out camping. The only question is where to go. New South Wales boasts some of the best caravan parks and camp sites in Australia, with well over 800 destinations to choose from. Understandably, picking the right one can be something of an adventure in its own right. Well, you can save your intrepid endeavour for the great outdoors because we've put together a shortlist of the best camp sites in Northern NSW. Whether you're a couple planning a weekend get away in a cosy canvas tent, or a family taking an annual holiday of fun and adventure, you'll find the right recommendation here. Just take a look at some of the leading campsites in the state right here, and choose where your oztrail adventure begins. Situated in the far north of the state, not far from Grafton, Wave Hill Station provides the best of both worlds. A cattle station of some 5,000 hectares in size, it gives campers plenty of room to pitch even a large cabin tent and get a taste outback but within a stone's through of the coast. The great Clarence River is also close by where canoeing, fishing and swimming can be enjoyed. You can take part in some of the daily farming activities. A favourite spot within the Myall Lakes National Park, in the North Coast region, Seal Rocks has been a favourite of many camping enthusiasts for decades. A poorly kept secret, the campsite retains its rustic roots, turning its back on the idea of allotted sites, and leaving it to guests where to pitch their canvas tents. Beyond the white sandy dunes lies a serene stretch of beach, punctuated by a rocky outcrop on which the local seal population hang out - thus the name. Located in Hunter Valley, about 200km and 4 hours drive north west of Sydney, Barrington Tops National Park is an 80,000 hectare haven for campers who want to indulge in the joys of the wilderness. There are a number of camping sites dotted around the area that offer biking, trekking, fishing, swimming, and canoeing in one of the most stunningly areas of the state. With a vast area of natural rain forests, scenic plateaux, bird and wildlife sanctuaries, crystal clear mountain streams, its ideal for lovers of the oztrail experience. 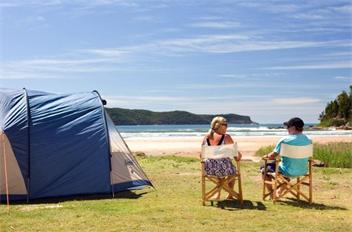 Umina beach is the closest of our selection to Sydney, which lies just 90km to the south, but it still manages to provide that feeling of escape that all campers look for. 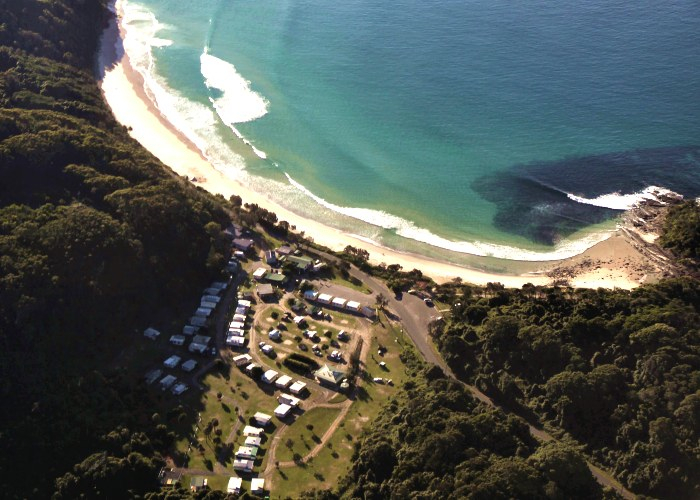 Sited just 16km from Gosford, its not short of camping and holiday parks, with Ocean Beach one of the most popular. Why? It has practically everything a beach camper desires, with powered and unpowered lots, that are either just a few steps from golden sands or are river side along Mt Ettalong Creek. 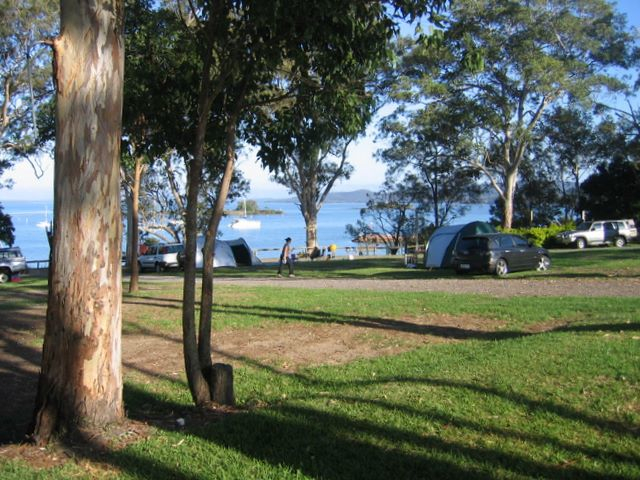 Like so many developed camping sites, Soldiers Point provides as much in the way of luxury as it does in the way of a traditional camping experience. In fact, the Soldiers Point holiday park boasts luxury villas, kiddies pools and WiFi facilities, but also provides stunning sea and beach views from the vast majority of its 45 dedicated canvas tent lots. Soldiers Point is close to Port Stephens, and lies almost 3 hours north of Sydney. Another northern gem, Ballina beach has managed to marry the glamour of a modern resort and the purity of the wilderness. Situated on 15 acres of land, this eco-friendly resort and campsite lies away from any major road, thereby ensuring tranquility to its guests. 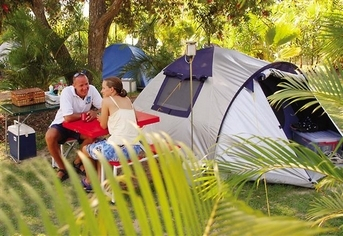 Its selection of powered and unpowered tent sites are large enough to host family tents of all descriptions. Natural ocean views, walks through flora and fauna, and even local dolphins to swim are also available, making the purists satisfied too. As its name suggests, Platypus Flat is home to one of Australia's most famous animals, the platypus, which can be found all along the Nymboida River that runs through the Nymboi-Binderay National Park. This site is for camping purists only. Caravans cannot make the journey and 2-wheel drives can only make it in good weather. Campers must bring their own firewood and drinking water, and bathing is done in swimming holes, surrounded by the most amazing red cedars, blue gums and river oaks. Family and cabin tents of even the largest dimensions are easily facilitated in lush grassy clearings. Situated close to Urbenville but more than 600km north of Sydney, Tooloom Falls campground is a favourite for those campers who hit the oztrail to get away from the stresses of civilisation. Located deep within the Tooloom National Park, nature abounds here, with clear water streams and creeks serving up ideal fishing conditions, and open bush providing ideal sites for camping. The Tooloom Falls themselves are a 60m wide and 10m high falls that have a central role in local Aboriginal folklore. 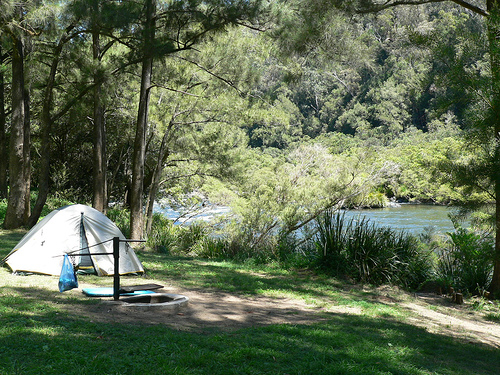 Camping attracts lovers of nature and lovers of outdoor activities, but for lovers of water sports in particular Stoney Park, just north of Port Macquarie on the North Coast, is an idyllic option. Campers have access to all holiday park facilities, including laundry and BBQ areas. Jet skiing and water skiing courses are available on 2 man-made lakes, while there is also an expansive canoeing lagoon and biking and bush walking to do. Set inland, at a 6-hour drive north west of Sydney. Dubbo has a wealth of natural wilderness and wildlife to make any camping stay a memorable one. But it's its proximity to the famous Taronga Western Plains Zoo, and BIG4 Dubbo Parkland that makes it ideal for all the family. Kids can catch a clear view of antelopes, elephants, rhinos and a host of endangered species in moat enclosed areas. The campsite, meanwhile, offers all the necessary amenities and is hailed as one of the best maintained sites in the region.